Posted on February 18, 2015 by Eric Bonnici wrote in Featured Lebanese, Featured Middle Eastern, Featured Seafood, Featured South Windsor Restaurants, Lebanese, Middle Eastern, Seafood, South Windsor Restaurants. It has 0 Comment. 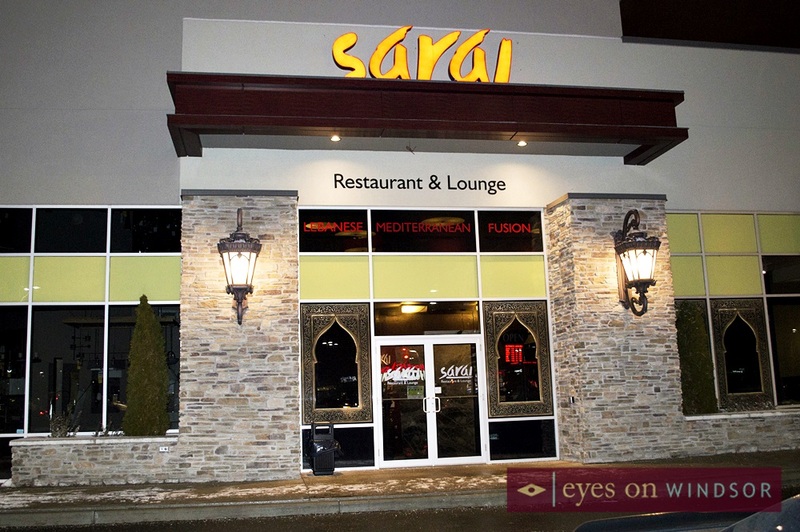 Sarai Restaurant & Lounge, located on Walker Road just South of Windsor Airport, serves a fresh flavourful fusion of Mediterranean and Lebanese style cuisine combined with a cozy open concept dinning room and contemporary cocktail lounge. Sarai translates from Arabic into “a house or inn for travelers to rest” and this trendy eatery tantalizes guest’s while they dine on a variety of vegetarian, meat, and seafood menu items. Drawing on wide variety of dishes and flavours of the Mediterranean and Middle East the chefs have created a fantastic selection of menu items. Grilled meats and veggies served include shish tawook, premium New Zealand lamb chops, marinated tenderloin beef, Persian kebabs, and Izmir (eggplant) kebabs. A wide selection of vegetarian options are available from hummus, lentil soup, and Halloumi cheese salad to tabouli, eggplant salad, and penne Arrabbiata. A favourite item is the restaurant’s signature Sarai red pepper puree. Seafood items include Provenchal black tiger shrimp, Mediterranean tilapia, and tahini cod. Some of the most popular menu items include the Sarai stuffed chicken, Sarai butter chicken, honey mustard salmon, and oozie pie. Vegetarian and gluten free options are clearly marked on the menu. An all you can eat lunch buffet is served on Sundays through Thursdays and appetizers are a fantastic deal on “Mezza Mondays”. 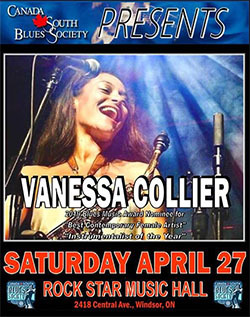 Guests will also enjoy a variety of live entertainment on Thursday through Saturday evenings. 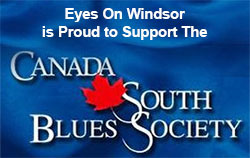 Catering is available and private parties are welcome to reserve sections of the restaurant. 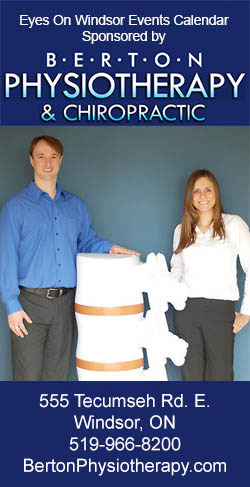 In addition, take out and delivery is available. 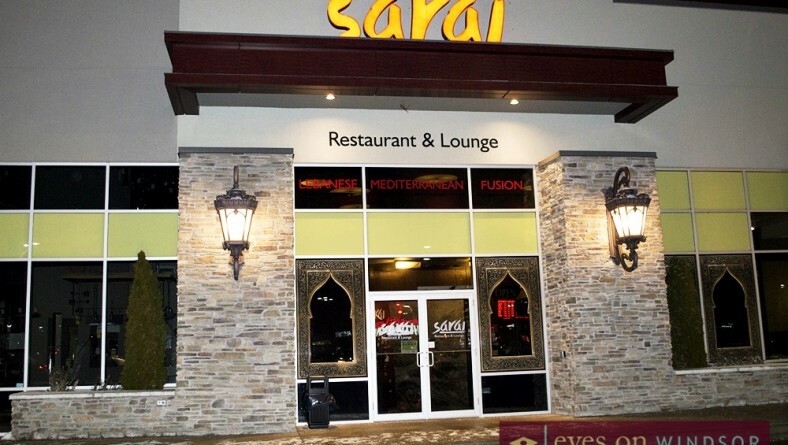 The soft lighting, uniquely distinctive decor, live entertainment, and first class friendly staff make Sarai’s dining atmosphere perfect for romantic date nights, family dinners, business lunches, or night out with friends. For marvelous Mediterranean and Lebanese cuisine and an ambiance diners are raving about Sarai Restaurant and Lounge is the perfect choice.